Our presentation was from Heidi Staples of FabricMutt.com. 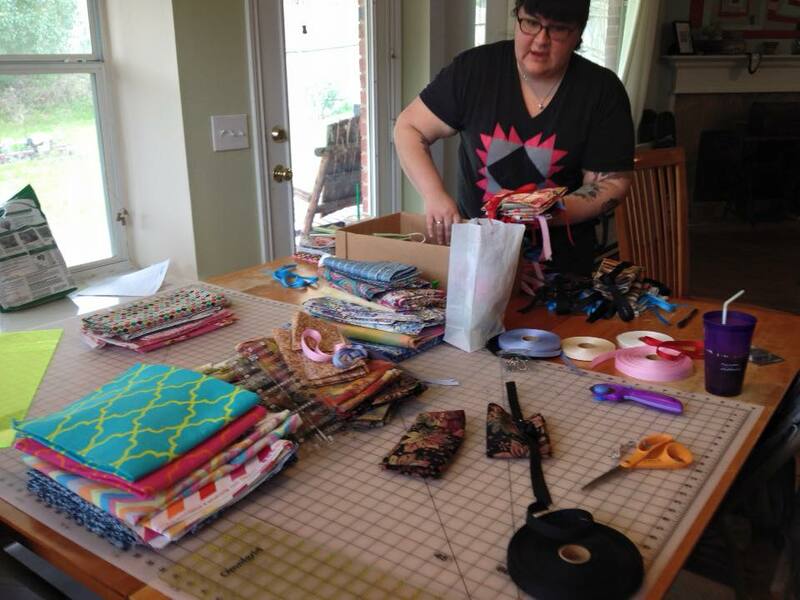 She wrote the book Sew Organized for the Busy Girl. But really her talk was all about making time for quilting and providing yourself the right place, space and opportunity to make your sewing time productive. She talked about her own history and how she got into her hobby - now business. I wrote down a bunch of statements she made that spoke to me. Here's a couple of my faves "Guilt does NOT belong in your sewing room." "Like the place where you sew." "Always look for better ways to do things. 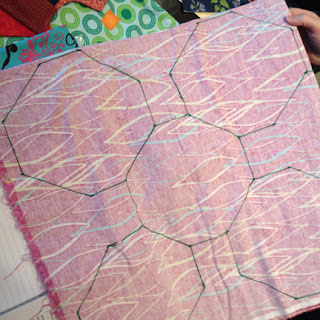 She gave lots of suggestions and shared her story through her quilts. It was a great presentation. Sorry if you missed her. Here's some pics you might enjoy. so she made a quilt. Then she made it bigger. and making them larger and more modern. She makes tools that help her and others be organized. are always ready to capture a new inspiration. Her own version of a spools quilt. There seemed to be a lot going on at this meeting. I took notes, but they're kind of confusing to me now. Joanna reported we had 69 paid members. One new member joined tonight. Lauren, Elizabeth, Lynn and Amy? won door prizes. We all voted on our favorite name tag. Last month's challenge was to make a new one and wear it. Many did. Kelly's was the favorite. 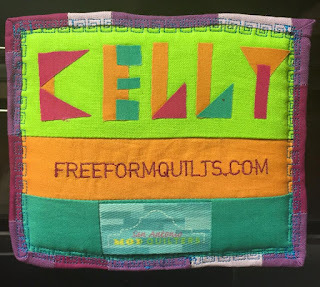 We had a report from those that went to QUILTCON. Everyone who couldn't be there really appreciated the pics. All agreed the lectures were incredible and offered their opinions on the best. We're still looking into alternate locations for our meeting. We had some volunteers for committee heads. Say thanks to Ellen who will be running retreats and Evelyn who will be heading up swaps and challenges. Next month will be our spring retreat. Final payments were due but there were still openings. See Sarah R if you want to go. There was a drawing for those who are participating in the Fancy Forest Quiltalong. Bunnies were due this month. Next is owls. After owls the QAL will take a break to allow others to catch up. During the break, some will be working on the Legendary pillow/quilt block. Jen reported she received 135 NICU blankets for Threads of Love during Feb-Mar. The Quilt Shop in Castroville sponsored that challenge. She will continue to accept donations all year. There's a blog post with instructions. Apr-May Charity challenge is for Days for Girls bags for hygiene items. Watch Facebook for charity sew-ins. This one is sponsored by Mesquite Bean. There's a blog post with instructions. Jen reminded everyone they could donate quilt tops to be finished for charities. If you have some hanging around and want to declutter, she will take what you go. Rebecca talked about the President's challenge. She brought in the art that inspired her and her interpreted quilt. For April, she'd like everyone to bring in their inspiration for the challenge. Quilts aren't due until August. These were the blocks for this month's BOM. Mary Ruth won the blocks. This is next month's BOM. Loretta had the corner fabrics on hand and the instructions will be posted on Facebook. You can see below what a quilt can look like made from this block. We had a great presentation but I'll post that separately. Hope to see you at next month's meeting. Once again, I'm a bit behind. 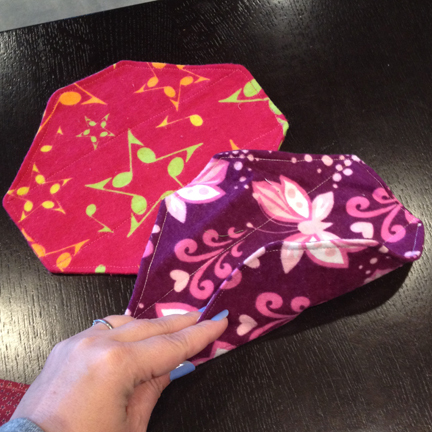 But here's the awesome eye candy from the March Sew-n-Tell. Sarah has been busy making beauties. Even her backs are gorgeous. Here's another from our prolific Sarah. she has some amazing quilts. unique binding method from Kelli. Kelli's Improv is Quilt as you Go. Kelli found a way to really use up a lot of scraps. Crocheting 2" strips into a bath mat. Sorry, Can't remember who made this beauty. Hopefully they'll let me know. is on the cross in their own hand writing. I'm pretty sure Jen quilted it. It might belong to Regan. on our Facebook site in case you missed it. This queen size quilt is by Jen. This baby size quilt is by Jen. Pieced quilt back by Jen. Jen made this from the BOM blocks she won. She has more blocks still to sew together. Cathy made this for Kristen's baby. All washed and crinkley and ready to deliver. Today we're kicking off the SAMQG Days for Girls Sewing Challenge! One of our members, Linda, brought the Days for Girls organization to our attention after seeing a presentation from one of their volunteers. The work Days for Girls does is amazing. Please take a moment to click that link. 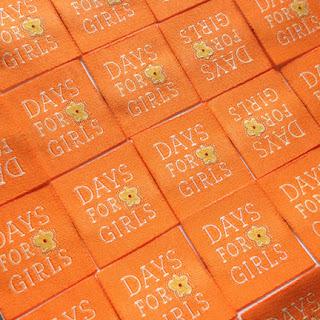 Days for Girls Mission: Creating a more dignified, free and educated world through access to lasting feminine hygiene solutions. You can also see the organization's founder, Celeste Mergens, TEDtalk as she shares the story of how Days for Girls started and why listening to the wisdom of those you serve is vital for creating culturally, socially and physically relevant solutions that change lives. -from DfG website. Video Link Here. So what is our sewing challenge? How do you make a drawstring bag? Complete pattern directions provided with exact specifications are included on the Days for Girls official pattern. Please be mindful of the fabric prints required and restricted. You will be able to pick up the Days for Girls label/patch at the April meeting. Each bag is needs a patch. 1 rectangle of fabric measuring 11" x 28"
The kits are ready and the pattern is shared. What next? April 8th from 10a-2p at Mesquite Bean Fabrics. If you are in the SAMQG, please RSVP on our "EVENTS" tab on Facebook. 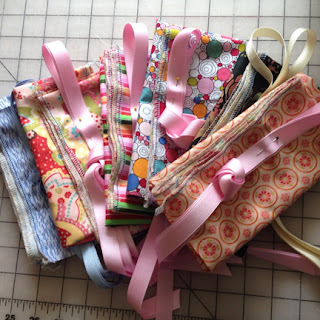 Kits will also be available at spring retreat, if you are looking to make a quick bag in your quilt-y down-time. 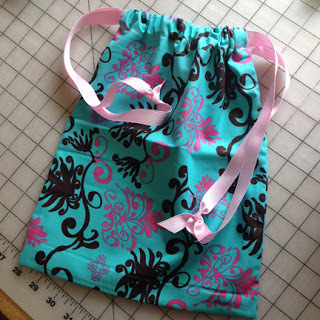 Of course, you are encouraged to sew as many drawstring bags as you like on your own, too. You do not have to attend an event to make a wonderful donation. Grab the pattern here. 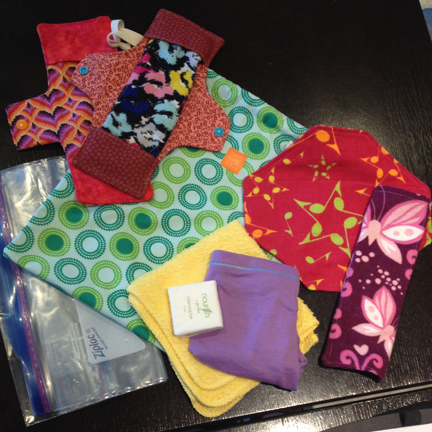 The kits include a couple different sewn items, including (2) shields and (8) flannel liners. Get the shield pattern here and shield template here. The liners are every bit as easy as our previous blanket sewing challenge. They are octagons folded in thirds. In the pattern HERE, you'll also find a square method for making liners using a serger. Easily make a few liners by downloading THIS TEMPLATE and following THESE DIRECTIONS. Cut pre-washed flannel easily by laying the template like this and cutting through two layers at once. Please be mindful of the fabric print requirements and restrictions listed on the pattern. Bring any Days for Girls projects to the May meeting. Anything you stitch is a more than welcome donation! Thank you! !